Using image-guided local treatments to create or augment therapeutic response to molecularly targeted immunogenic drugs. Nearly 9.6 million people worldwide and 600,000 Americans die from cancer each year. In the near future, cancer-related deaths are projected to overtake heart disease as the leading cause of death in America.1,2 Progress has been made over the last several years to stem the tide of cancer mortality by diagnosing cancers earlier and curing early stage cancers before progression. Among the most revolutionary and successful approaches have been in the fields of immuno-oncology and interventional oncology (IO). Both of these fields have inspired new hope in treating incurable cancers and in improving tolerability and adverse event profiles for oncotherapies. Perhaps the most intriguing aspect regarding these approaches is their potential interplay in augmenting efficacy, further personalizing therapy, and broadening the scope for treatable cancers. Immunotherapeutics are a heterogeneous class of antineoplastic agents that aim to harness the existing infrastructure of a patient’s immune system to cause direct or indirect cell death. The approach is predicated on a few key recognitions. 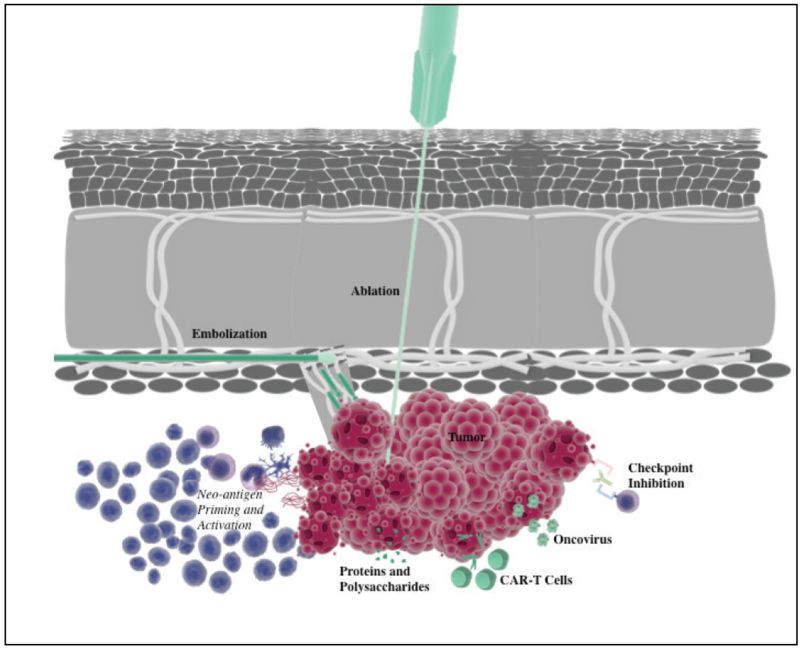 First, the immune system is equipped with an antitumor mechanism, known as “cancer immunoediting,” which malignancies must subvert to become pathologic and restoration of which may allow for the treatment of a tumor.3 Secondly, the specific microenvironment, or niche, of a tumor is a key factor in tumor response to any therapy and its constituent elements of effector cells, such as CD4+, gamma delta (γδ), and CD8+ T cells (tumor-infiltrating lymphocytes), play a key role in regulating the antitumor response. Ultimately, every immuno-oncologic therapy uses these pathways to harness the native immune system against malignancies. The different techniques used in immunotherapy include monoclonal antibodies against cell surface markers, oncolytic and cancer vaccines, polysaccharides, cytokines, and chimeric antigen receptor T (CAR-T) cells (Table 1). The most well-known and successful immunotherapy to date is checkpoint inhibition with monoclonal antibodies targeted against the programmed death receptor-1/programmed death ligand-1 (PD-1/PD-L1) axis and cytotoxic T-lymphocyte associated protein 4 (CTLA-4). The PD-1 molecule is a transmembrane IgG protein that, when bound by its ligand PD-L1 in the context of major histocompatibility 1 stimulation, can decrease antitumor T cell proliferation, cytotoxicity, inflammatory mediator release, and self-tolerance.4-6 That is, the PD-1 axis can help tumor cells evade the immune system. Consequently, when a PD-1 axis inhibitor disrupts this chain, T cells may be able to detect, be primed by, and eliminate tumor cells. The FDA has now approved PD-1/PD-L1 inhibitors for a broad range of indications including non–small cell lung cancer (NSCLC), metastatic melanoma, head and neck squamous cell cancer, urothelial cancer, gastric cancer, cervical cancer, hepatocellular carcinoma (HCC), and solid tumors with high microsatellite instability (MSI-H). Although lung cancer and metastatic melanoma are among the most common malignancies, the approval to treat microsatellite instabilities offers tremendous potential in expanding the scope for checkpoint inhibition and personalizing future oncology research. CTLA-4 is a T cell surface protein receptor that inhibits T cell activation after detection and activation against self-antigens. This pathway is among different immunoediting approaches that tumors such as melanoma have employed to evade the immune system.7 The only FDA-approved CTLA-4 inhibitor at present is ipilimumab (Yervoy, Bristol-Myers Squibb), although others (eg, tremelimumab, AstraZeneca) are close to approval. The indications for CTLA-4 inhibitors are narrower as compared with PD-1 axis inhibitors and are only approved in metastatic melanoma, renal cell carcinoma, and MSI-H tumors. However, combination therapy, particularly for melanoma, has shown tremendous promise, and studies for MSI-H tumors are ongoing. Clinical trials in multiple phases are presently underway not only to expand the number of checkpoint inhibitor and oncoviral therapeutics and their scope, but also to diversify mechanisms of action. Polysaccharides have been used in East Asia for antitumor immunogenicity for decades but are now under investigation in the United States for disrupting signaling pathways for tumorigenesis, upregulating proinflammatory cytokines, and vaccination. Peptides such as cytokines are also candidates for antitumor immunotherapy to stimulate and prime the immune system or disrupt other signaling pathways. Lastly, CAR-T cells, transformed T lymphocytes with recombinant antigen–binding and T cell–activating receptors specifically created against a tumor antigen, have shown tremendous promise in liquid tumors; however, research in solid tumors remains to be conducted. Immuno-oncology uses two main approaches, antibodies and antigens, to stimulate the immune system against diverse molecular targets. In contrast, IO uses diverse techniques to induce apoptosis or necrosis. The topics of chemoembolization, bland embolization, radioembolization, and ablation are familiar to this audience and are briefly discussed herein. In the context of IO, the target is typically a tumor, and the smallest accessible feeding branches are typically selected to minimize the risk for nontarget embolization. Delivery platforms that can be used include particles, radionuclides, or chemotherapy. Ablation is image-guided induction of direct tumor destruction by noxious stimuli. Ablation techniques can employ heat-based thermal mechanisms such as radiofrequency ablation, microwave ablation, and laser ablation or hypothermia-based thermal mechanism such as cryotherapy. Additionally, high-intensity focused ultrasound can be used via acoustic cavitation to cause coagulative necrosis. Irreversible electroporation uses a high voltage to destabilize cellular membranes and induce predominantly apoptosis as well as necrosis across the ablation zone. WHY USE IO x IO? IO and immuno-oncology (IO x IO) are both the “newest kids on the block” in their respective fields and have revolutionized and invigorated their fields and uniquely advanced the field of oncology. Although both fields continue to evolve, refine, and develop their present successes, a greater aspiration still remains. In particular, the hope is that the combination of these therapies is not simply additive but iterative or exponential. There are three main goals of IO x IO: to enhance the level of antitumor response, overcome resistance, and potentially induce a systemic immune resynchronization to treat metastatic cancers in addition to interventional targets (Figure 1). Figure 1. Immuno-oncology and IO treatments. Effects and modifications at the “niche” or tumor microenvironment is one of the potential explanations for how and why IO x IO therapies work. It has been proposed that ischemia and cell destruction caused by interventional techniques result in fundamental changes in peptide expression in nearby support cells (eg, stromal cells) as well as recruit new naive and programmable immune cells. These modifications may enhance susceptibility of tumor cells for the concomitant immunotherapy. The other prevailing hypothesis for how combination IO x IO therapies function involves the creation of neoantigens against which the immune system can be primed. This approach involves the use of tumor ablation that causes necrosis and releases potential antigenic peptide fragments while inciting an inflammatory response. Macrophages and other antigen-presenting cells then phagocytize these fragments to prime the immune system. Response to concomitant immunotherapy may then be induced (for resistant tumors) or enhanced. The concept of IO x IO is an intriguing space for research given its potential impact on therapies for currently incurable cancers. However, despite significant enthusiasm, there are key limitations that must be addressed and critical questions that remain to be answered. With regard to limitations, the biggest barrier to widespread adoption of IO x IO techniques is the need for a robust large data set and carefully designed clinical trials. Until well-designed clinical trials are completed, there will remain a need for an empirically proven substantive improvement in clinical outcomes as well as consequent skepticism in the oncology community. Additionally, a major question that warrants further careful evaluation is what treatment protocols for the combined approach are the best; for example, which therapies (embolization and CTLA-4 inhibition, irreversible electroporation and oncolytic viruses, transarterial radioembolization and PD-L1 inhibition) are the most immunogenic and what host factors impact their outcomes. To answer these questions, significant further basic and clinical research remains to be conducted to determine the mechanism(s) of action by which IO x IO therapies work, as well as to quantify the antitumoral effects of combination therapy via translational oncologic research. Research is underway to determine whether local delivery of immunotherapy offers benefit compared to oral or intravenous techniques. So far, hepatic arterial instillation of CAR-T cells has shown positive results in phase 1 trials, but it is unknown whether this translates to efficacy and whether other immunotherapies will show similar results.16 Lastly, the moonshot for IO x IO therapies is to use these treatments to induce positive immunologic responses in cancers otherwise not responsive to immunotherapy. The concept of IO x IO is truly remarkable: using image-guided local treatments to create or augment therapeutic response to molecularly targeted immunogenic drugs. Yet, significant work remains, requiring collaboration both within and between both “IO” communities. This combination approach offers the potential to fundamentally change how advanced cancers are treated and offer hope to patients who presently have very few treatment options. 1. American Cancer Society. Cancer Facts & Figures 2018. Atlanta: American Cancer Society; 2018. https://www.cancer.org/content/dam/cancer-org/research/cancer-facts-and-statistics/annual-cancer-facts-and-figures/2018/cancer-facts-and-figures-2018.pdf. Accessed September 19, 2018. 2. Heron MP. Deaths: leading causes for 2016. Natl Vital Stat Rep. 2018;67:1-77. 3. Dunn GP, Old LJ, Schreiber RD. The immunobiology of cancer immunosurveillance and immunoediting. Immunity. 2004;21:137-148. 4. Garon EB, Rizvi NA, Hui R, et al. Pembrolizumab for the treatment of non–small-cell lung cancer. N Engl J Med. 2015;372:2018-2028. 5. Okazaki T, Chikuma S, Iwai Y, et al. A rheostat for immune responses: the unique properties of PD-1 and their advantages for clinical application. Nature Immunol. 2013;14:1212-1218. 6. Pardoll DM. 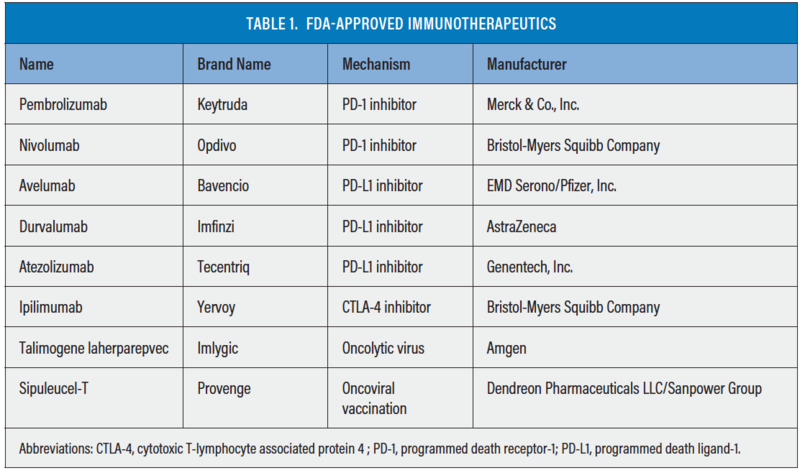 The blockade of immune checkpoints in cancer immunotherapy. Nature Rev Cancer. 2012;12:252-264. 7. Wolchok JD, Saenger Y. The mechanism of anti-CTLA-4 activity and the negative regulation of T-cell activation. Oncologist. 2008;13(suppl 4):2-9. 8. Russell SJ, Peng KW, Bell JC. Oncolytic virotherapy. Nat Biotechnol. 2012;30:658-670. 9. Kantoff PW, Higano CS, Shore ND, et al. Sipuleucel-T immunotherapy for castration-resistant prostate cancer. N Engl J Med. 2010;363:411-422. 10. Slovak R, Ludwig JM, Gettinger SN, et al. Immuno-thermal ablations–boosting the anticancer immune response. J Immunother Cancer. 2017;5:78. 11. Deipolyi AR, Bromberh JF, Erinjeri JP, et al. Abscopal effect after radioembolization for metastatic breast cancer in the setting of immunotherapy. J Vasc Interv Radiol. 2018;29:432-433. 12. Guo Z, Meng C, Wei X, et al. Combination nivolumab with transcatheter arterial chemoembolization for clinical remission of small cell lung cancer: a case report. Thorac Cancer. 2018;9:646-651. 13. Bäcklund M, Freedman J. Microwave ablation and immune activation in the treatment of recurrent colorectal lung metastases: a case report. Case Rep Oncol. 2017;10:383-387. 14. Wehrenberg-Klee E, Goyal L, Dugan M, et al. Y-90 radioembolization combined with a PD-1 inhibitor for advanced hepatocellular carcinoma [published online May 29, 2018]. Cardiovasc Intervent Radiol. 15. Duffy AG, Ulahannan SV, Makorova-Rusher O, et al. Tremelimumab in combination with ablation in patients with advanced hepatocellular carcinoma. J Hepatol. 2017;66:545-551. 16. Hardaway JC, Prince E, Arepally A, Katz SC. Regional infusion of chimeric antigen receptor T cells to overcome barriers for solid tumor immunotherapy. J Vasc Interv Radiol. 2018;29:1017-1021.e1.